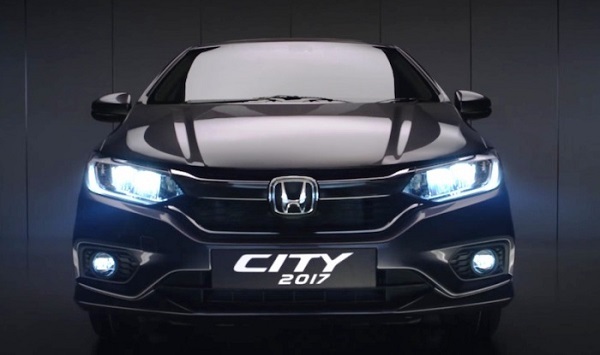 Honda has planned to launch the all new City 2017 facelift on February 14, 2017 (tomorrow) but the brochure of the same has been leaked in the automobile sector before its official launch. The brochure contains all its variants, specifications and features information. This mid-size sedan from the Honda will arrive in the Indian car market in five trims with some tweak in exteriors and interiors. The all new Honda City 2017 variants will be named as S, SV, V VX and the top-end variant as ZX. It will be launched in both diesel and petrol models to deliver efficient power and mileage. The petrol variants of the all new City might be equipped with a 1.5L i-VTEC engine which is producing the power output of 118bhp/145Nm while the diesel models will run on 1.5L i-DTEC powertrain supplying power output of 99bhp/200Nm. The Honda City petrol will be launched with a 5-speed manual and CVT transmission system while the diesel variant will have a 6-speed gearbox to deliver the fuel efficiency (ARAI-certified) of 18 kmpl with CVT petrol (17.4 kmpl MT petrol) and 25.6 kmpl with diesel (MT) variants. 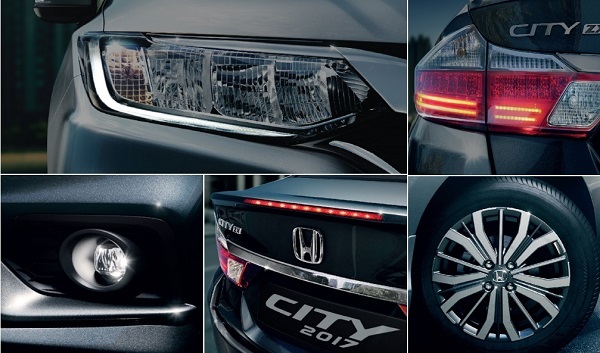 The 2017 Honda City facelift have some tweak in exteriors like re-designed LED headlamps with DLRs, LED fog lamps for bad weather conditions, 16-inch diamond cut alloy wheels, the new LED rear spoiler, LED tail lamps and one touch open/close electric sunroof that all giving it classy looks. Talking about the interiors, all new City sedan furbished with a 7-inch infotainment touchscreen with navigation system, mirror-link smartphone connectivity, voice recognition, steering wheel with feature buttons, leather seats, music system and many others that makes the driving comfortable and entertaining. 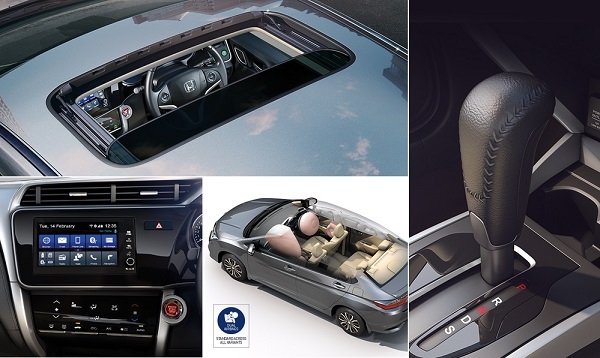 For the safety purpose, this mid-size sedan might be equipped with the dual safety airbags, ISOFIX child seat safety mounts (standard feature), improved braking system with ABS and EBD, cruise control while the top-end models will have the 6 airbag safety features. There is no final words from the Honda Cars India about the price of all new City facelift, but it is expected to be launched at Rs. 8.5 – 12.5 Lac ex-showroom.